A few weeks ago, one of our local stores had 6 ounce containers of blackberries on sale for 50¢ each. I have never seen them that cheap before, so I loaded up my cart, then came home and froze them. Now, with the weather warming up again, I like to have a smoothie a few times a week. I haven't tried making a blackberry smoothie before, but with my freezer stocked, this week has been the perfect time to give it a go. 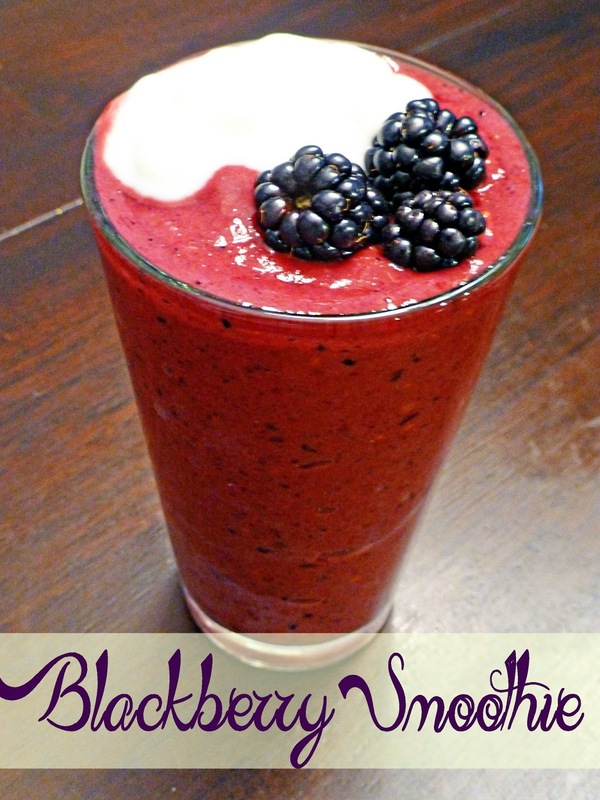 Normally, strawberry based smoothies tend to be my favorite, but this blackberry smoothie recipe might knock the strawberry right out of the water! It's that delicious! Combine all ingredients in a blender. Blend until smooth. Top with a spoonful vanilla yogurt if desired. Serve Immediately. Oh now this is right up my alley! I am BIG on smoothies and always looking for new ones to try! lucky you! We have strawberries and blackberries only in spring or early summer and only for a few weeks. This looks and sounds super duper yummy!! Whoa! Yum! I could drink this. I really could! Wow. Thanks for the update on the surprise for lil ol' moi. Have a great Spring Break, no kidding. YUmm! I want soome!! nom nom,.... looks so full of anti oxidants~! When does the Blackberry Smoothie party start? Count me in! Looks delicious. P.S. Find your show at my show. Dezzy, Pat The Cat, the Holy Ghost Writer and even Adam.... they're all there.... waiting. I love blackberries!! That was a good score at 50 cents a box. I think the cheapest I have ever seen them here is 2 bucks. Although if you go to Vancouver and area, you can pick them for free. Me and a homeless man were having a feed on them and discussing how tasty they were! I can't help but crack up laughing at this. I can just picture you and the homeless man popping a squat next to a blackberry bush and enjoying a nice snack together. Oh, that's great! I wish I could find some free berries like that around here. We do get a few weeks in the summer where the mulberries are in bloom, and we take full advantage of picking those. That's about the only free berries we come across in our neck of the woods. That would be so refreshing on a hot day.. if we ever get a hot day that is. I am so going to make this for my Hubs. Blackberries are his favorite.